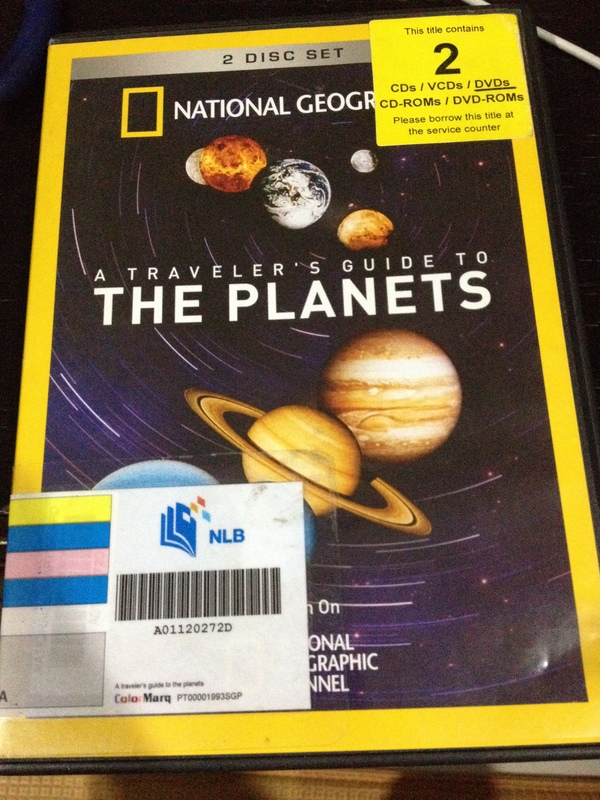 Our topics are chosen based on the boys’ interests, for example if they happen to choose a Magic Schoolbus DVD on Space when we go to the library, their interest might be piqued after watching the DVD and they start asking lots of questions. And I guess once we start to delve into the topic, they get more interested and ask more questions. As it is, I have no idea when we will finish up on the Outer Space theme, and neither do I know what activities we will be doing next. 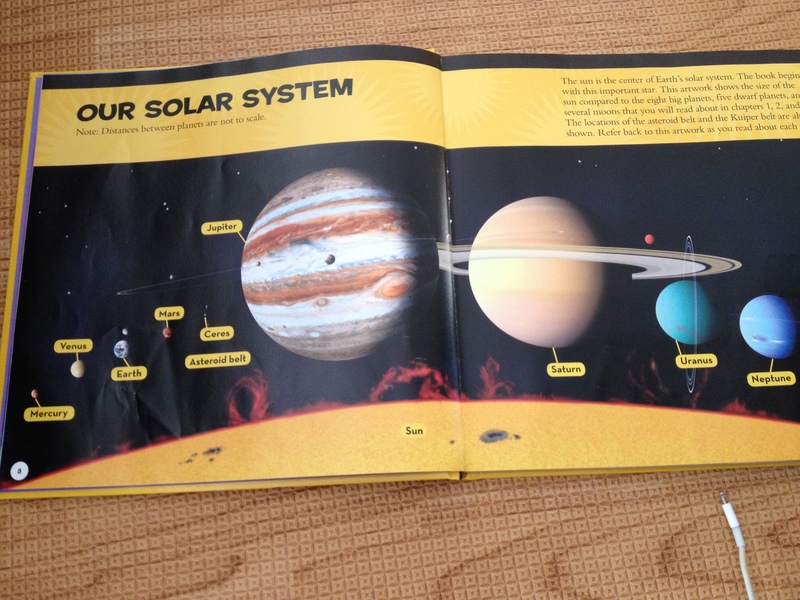 For a start, we read National Geographic’s Little Kids First Big Book of Space. Then we made our very own Solar System! So, they thought those were asteroids, until Mummy here got herself educated (thanks, Google!) and corrected them about the differences between the two. 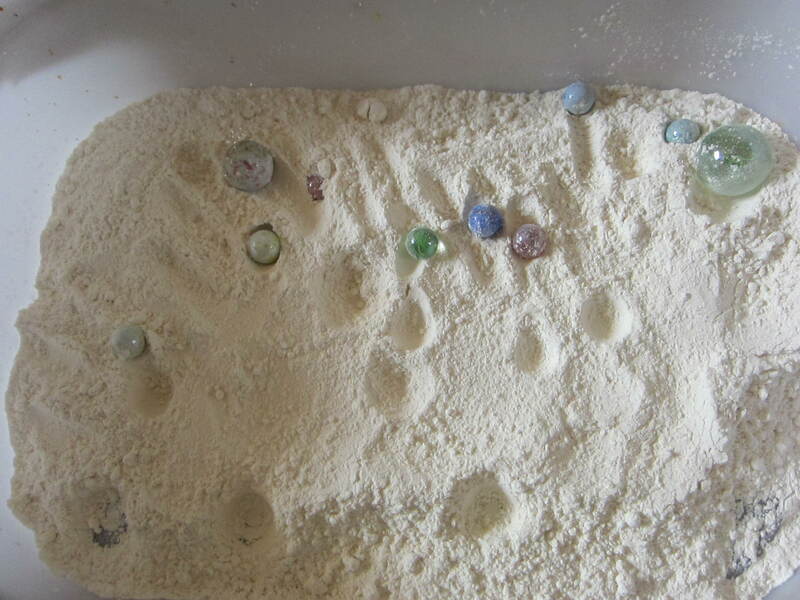 Then we did a fun hands-on activity – throwing marbles into a container of flour! 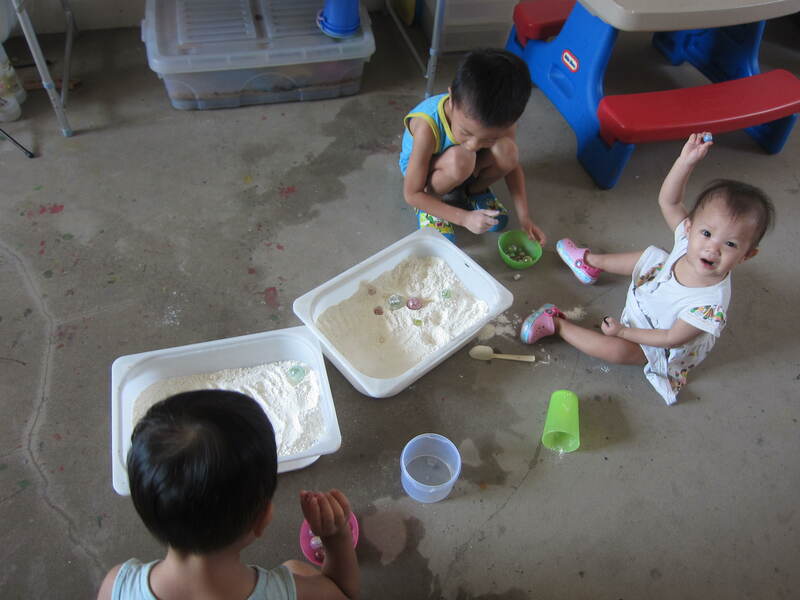 The kids saw how the impact made craters and how it made the flour ‘fly’ up. There are more things which I would love to explain and demonstrate to the boys, more questions they asked which I do not know how to show them – the Earth’s atmosphere, how the atmosphere prevents more meteoroids from hitting the ground, the Earth’s magnetosphere, how the magnetosphere protects Earth from solar flares and geomagnetic storms. But these are things which we can’t see, so I am really at a loss. On the positive side, in order to explain the difference between the gas giants and rocky planets like Earth, we have done a few simple experiments and observations about gases, liquids and solids, which are all around us. I had thought it would be difficult to teach about gases, since they are invisible. But hey, I guess ‘earthly’ things are still comparatively easier! I was also very disturbed (haha) that the Planets DVD did not include Earth! Earth is a planet, isn’t it? After seeing all those volcanoes etc on other planets, how could I not let the kids marvel at our very own Planet Earth? Thus, while we are not done yet with Outer Space, we are quite into geography now. Am not a fan of television for the kids, but when it comes to planetary magnificence, I surrender. Time for some volcanic action! Ta-ta! Nice? I feel so proud of myself, hee hee. To tell the truth, this DIY isn’t cheap. And I hate to do any sort of DIY-craft. Because I am really handicapped in this area. But I couldn’t find any solar system model which met all my requirements: 1) the planets have to rotate around the sun; 2) the planets must be able to spin; 3) the planets must be big enough. Seriously, I was willing to pay good money for a satisfactory model, exactly because I knew that I would end up having to spend big bucks on DIY anyway due to my lack of talent. DIY talent means being able to use whatever available or easily available materials to create something nice. I fail! Still, to commemorate my great achievement, I must blog about it! The easy part was to paint the styrofoam balls, which I outsourced to the two boys. They referred to National Geographic’s First Big Book Of Space while painting. Then the difficult part… how to attach the balls to the stand??? I had thought thick wire (2mm) would do the trick..
… which worked fine for the first four planets… But there was no way it could hold up Jupiter! Bought 3mm wire to try but it didn’t work either. I even tried to do ‘suspension’.. haha… Consulted my inhouse engineer, and he said the only way was to hang them from rods (like lanterns). And so, I had my first encounter with a saw! 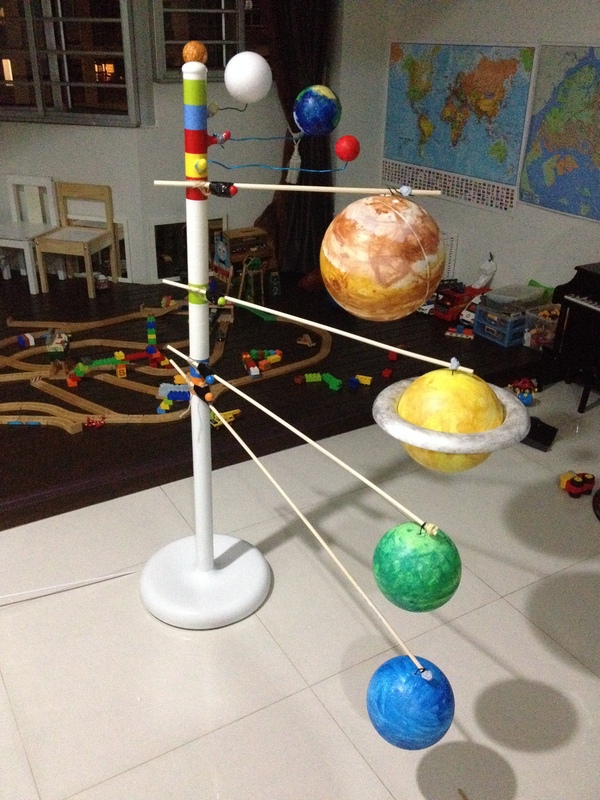 Cut the dowel rods to the required lengths, and then tied and taped them to the stand at various angles so that the planets would not collide in their rotation. After many nights of sitting and staring at the stand and balls, and a couple more nights of hard labor, it’s finally done! I didn’t involve the kids much in this, other than to paint the planets, because of self-awareness that I lacked the aptitude to do this DIY with ease and would not have the patience to put up with their ‘help’. What I could do was to leave the half-completed model out so that they saw my failures every morning. I told them I tried out a method but it didn’t work, so I would have to think about it and try again.